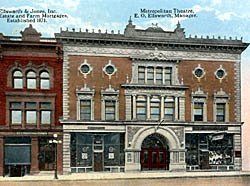 The design and construction of the Metropolitan Opera House (1899) was commissioned by one of Iowa Falls' most noted citizens, Eugene S. Ellsworth. At the time of its opening at the turn of the century, the theater was considered the most attractive and complete opera house in the state. Attendance at the grand opening performance numbered 800 people, making the evening the "biggest social event in the history of Iowa Falls." The theater soon gained a reputation as the "big time theater in a little town." Patrons came from miles around for the productions staged here, such as Faust, Uncle Tom's Cabin, and The Merchant of Venice. John Phillip Sousa's band performed more than once on the stage. By the late 1920s, vaudeville and silent movies had become the stock-in-trade and the first sound system was installed in 1930. From that time until 1952, Ellsworth College drama productions, high school plays, dance recitals, and concerts were still performed between movie programs. The three-story façade of the Metropolitan is executed in one of the popular late 19th-century modes, Italian Renaissance. This façade is rich in the detailing of the style; quoined from grade to the frieze, the frieze is garlanded and topped with a bracket-supported cornice, fenestration consists of three types of windows on the second and third stories. The first story is simpler. A single storefront entrance flanked by a corbelled arch serves as the theater entrance. The main floor of the original theater once seated 441 and the balcony seated 390. The stage was 66 feet wide and 30 feet deep with large wings to either side. The second and third floors at the front of the building were occupied by offices. A third floor ballroom is still mostly intact but has not been restored. 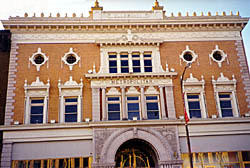 In 1997 the building was renovated by it's current owner Bob Fridley, an entertainment company owner from Des Moines. There are now two movie theaters inside, and the second and third floor offices house the projection and sound equipment. The building is located at 515 Washington Ave., in Iowa Falls. Now a movie theater, visit their website for more information.